Rooibosch Tea Delicious, refreshing, full of natural goodness, organically grown and harvested by hand. Naturally caffeine free. Eleven O’Clock is the most renowned South African rooibosch tea. 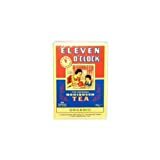 This delicious tea is soothing and naturally caffeine free, and can be enjoyed at any time of day and by the whole family, it even makes an ideal drink at bedtime. Rooibosch (rooibos or redbush) tea is soothing, sweet tasting and naturally caffeine-free. This delicious tea grows only in South Africa’s coastal mountains of the South Western Cape. The rooibosch selected for Eleven O’Clock is GM free and organically grown, it contains no artificial additives or flavours and is harvested by hand and cured naturally in the sun. This entry was posted in Organic Health Products and tagged Organic by Organic Health. Bookmark the permalink.